Even if you practice good oral hygiene at home, you can still suffer from tartar buildup, cavities, and other oral health issues. Left untreated by a professional dentist, these concerns can develop into more serious problems that require costly, extensive treatments. A regular dental exam and professional cleaning is the best way for Drs. Thaddeus H. Vincent, Jr., David M. Van Patten, William T. “Buddy” Noonan, Jr., and Alexander Whittington to diagnose oral health concerns early on so that you can enjoy a healthy smile for life. We recommend that every patient, young or old, visit either of our practice locations in Sumter, SC, every six months for their dental exam. A regular dental exam should be an important part of your entire family's preventive health plan. Even if you do not smoke or have preexisting conditions such as diabetes that make you more susceptible to certain conditions, you are still vulnerable. Tooth decay and gum disease, in particular, are extremely common nationwide. Left untreated, they can have a negative impact on the look and feel of your smile, as well as your overall health. Therefore, early detection, fast treatment, and ongoing prevention are essential parts of keeping your teeth healthy. Dental exams are an important part of maintaining dental health, for both children and adults. To begin, our team will take digital x-rays and images of your smile. These help us detect oral health issues such as fractures, decay, and infection that might not be visible to the naked eye. One of our doctors will then review these images with you and perform a thorough visual exam. During the exam, the doctor will measure the depth of your gum pockets to check for gum disease, look for signs of cavities or damage, and evaluate the alignment of your bite. They will also look for lesions that might indicate oral cancer and ask you to open and close your jaws to see if you have any degree of a temporomandibular joint (TMJ) disorder. If we find any cavities, gum disease, or infection during your exam, we can often perform treatment on the same day. We see patients of all ages, allowing you to schedule regular dental exams for your whole family at one of our two locations. 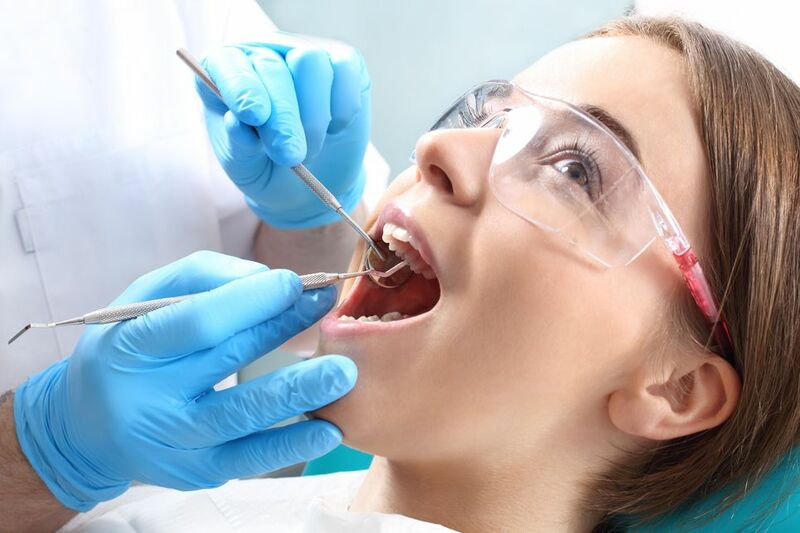 One of our hygienists will then administer a professional, preventive hygienic cleaning, also known as a prophylaxis. Because your dentist has specialized tools and solutions, a professional cleaning is more effective at removing plaque and tartar above and beneath the gum line than brushing and flossing alone. Your cleaning will be completed with a polish to help your smile look bright and healthy. At the end of your dental exam and cleaning, our team will also review the basics of at-home brushing and flossing with you. Why Bother with a Dental Cleaning? Improve the beauty of your smile: Without stubborn plaque and tartar buildup in hard-to-reach areas, your smile can look cleaner and healthier. Detect issues early on: In many cases, regular exams allow our doctors to detect oral health issues early on in their most treatable stages. Cost-effective prevention: A dental exam and cleaning is a cost-effective treatment option because it allows our team to detect oral health issues before they need to be addressed with more expensive restorative treatments such as root canal therapy or dental implants. Boost your overall health: There is an indisputable connection between your oral health and overall health. By keeping your smile healthy, you can help reduce the risk of serious systemic conditions such as heart disease, which has been linked to gum disease. We see patients of all ages, allowing you to schedule regular dental exams for your whole family at one of our two locations. To schedule appointments for your whole family today, call us at (803) 773-5411 or contact us online.